Aibhilin, her husband Declan Gobha and their son, Evan joined the SCA in 2008. She resides in the Barony of Iron Bog where she is currently serving as the Baroness of Iron Bog. 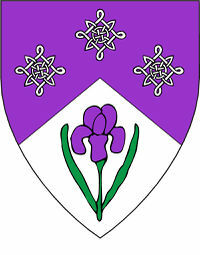 In the past, Aibhilin has served as Chancellor Minor, Mistress of Arts and Sciences and Chronicler for her Barony. Aibhilin is also a member of the Tadcaster Militia where she serves as Yoot Wrangler. Aibhilin's passion is lampworking (i.e., making glass beads), in particular, studying about medieval Irish glass beads. She loves learning new and more advanced techniques as well as making jewelry with both period and modern designs. 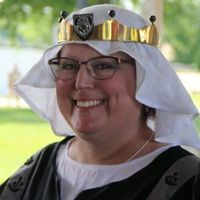 She has been working with Mistresses Elysabeth (Lissa) Underhill and Brunissende Dragonette on experimenting with making period furnaces on which to make beads. She is learning the joys of research and documentation. She enjoys sewing garb for herself, her husband and son. She is learning to use a lucet, to weave trim on an inkle loom, and to do bead embroidery. She hopes to learn to knit something other than a scarf. Schola in the Shire, Taught a class on glass beads with Mistress Elysabeth (Lissa) Underhill; focusing on medieval Irish beads. This page was last edited on 3 September 2018, at 17:25.